Gates should be installed in all entryways which parents want off-limits as well as in all accessible stairways that do not have a door to close and lock. Alternatively parents might prefer a gate vs. always keeping the door shut and locked. High traffic areas should have easy-to-access swing-through gates. Pressure gates (which are more difficult to access, and may involve removal each time you use it) are more appropriate for lower traffic areas. It is highly recommended to install safety gates at the top and bottom of the stairway. 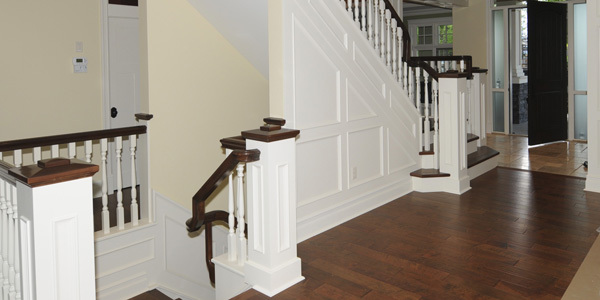 Some stairways which have other than straight wall-to-wall mounting surfaces (i.e. steel or wooden banisters, non-level mounting surfaces) will likely require a wood mounting kit. Child Proofzone Inc. will advise you of your gate options, and will recommend gates which best meet your needs and preferences. Installing a gate yourself is always an option, but is not recommended; gates improperly installed will not perform as they were intended, and may present more of an injury risk. Children should not be allowed to jump or climb on the gates as this can lead to poor gate performance, damage to the gate and/or injury to anyone trying to jump over the gate. If you have rugs, make sure that they are secured with rug tape or have non-slip backing. Banisters that have pickets with a width that exceeds the maximum code (3.5-4 ") or that are climbable, should be covered with a banister guard to prevent your child from falling through the pickets. Door knob covers can keep babies from opening doors but can be opened by older siblings. This is sometimes preferred, so parents don't have to continually open the doors for the older children too. Lever-style door locks are also available for levered door handles. Use bi-fold door locks to prevent babies from pinching their fingers and/or opening bi-fold doors. Other options for keeping doors secured: Overhead door latches, safety hook & eyes, barrel bolts, flip locks.